Make use of your extra counter space with one of our metal 5 Tier Display With Clip Strips. 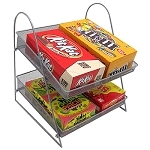 You can display such items as matches, boxed gum and candy while showcasing small bags of chips on both sides of this one free standing fixture. 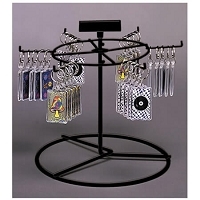 Our wire display stand comes with adjustable shelves that are 14 inches wide with graduating dimensions ranging from four and a half inches to eight and a half inches. 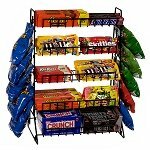 Be versatile with this display by creating a one-stop-shop for your snack-able foods. This black wire stand has been powder coated to last for the duration. Some assembly is required, but don't worry there is no complications here when assembling. 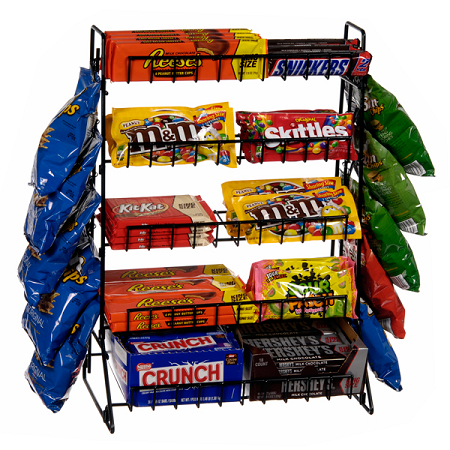 Take a chance on increasing snack sales by ordering your black colored counter rack from us today! Each Angled Shelf Is 14" W With Graduated Dimensions From 4 1/2" To 8 1/2"
Perfect addition to my theater room! Exactly as expected!